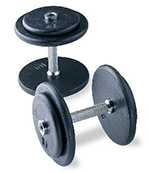 The kneeling Bosu side dumbbell raise is an intermediate exercise. This is a surprisingly challenging exercise that targets the shoulders and also helps to strengthen the core. This exercise is suitable for intermediate to advanced fitness levels. Start in a kneeling position on the Bosu with both feet off of the floor, your back straight and your shoulders pulled back in the shoulder girdle. Raise the dumbbells up to shoulder height, pause and lower them back down to the side of your hips. Repeat the action and make sure to keep your core engaged throughout the entire exercise.